Aaron stayed home from school one day a week before Spring Break. He had a real fever. He wasn’t faking. It was simply a coincidence that it was March Madness, simply a coincidence that fever struck the same time last year, requiring him to spend hours in bed watching televised basketball games. But on this particular stay-home day, there were no games on until late afternoon. And so it was that he found himself at home with me, too weak to play basketball outside, wondering what to do. I’m a gal who likes my arts and crafts, but Aaron can rarely be bothered to draw or paint. We spend much more time playing sports together than sitting side by side creating. With one exception: he is passionate about drawing team mascots. Last Fall he mastered the top 25 college football teams and every Major League Baseball insignia. So I pulled out some old business cards that I will never need again (my former law firm being defunct), my favorite oil pastel crayons and made him an offer. Pause. “Um, okay . . .” He diligently set to work. His hands and face concentrated on the colors and small papers, ignoring all else. 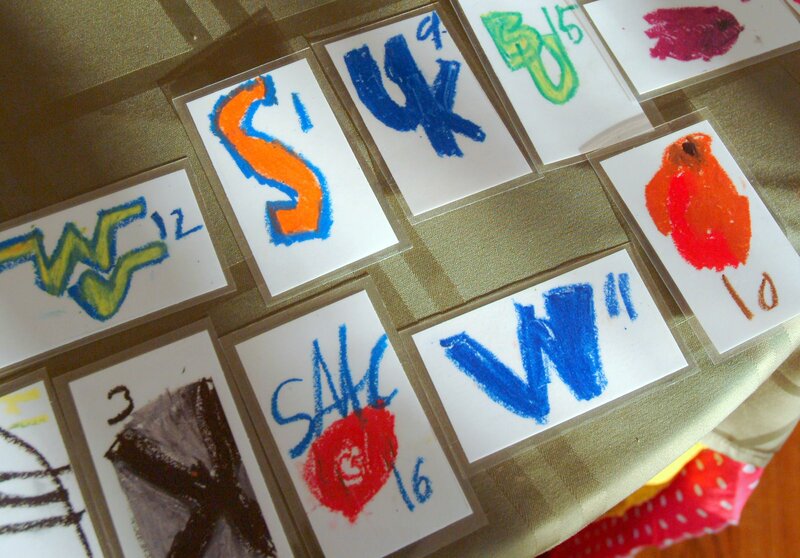 When he looked up, he had completed drawing all the “Sweet 16” mascots. The drawings were so vibrant, I asked if we could make color copies of them. That triggered his idea: we could play a game with them, like Go Fish. And we could call it—Go Swish, as in, nothin’ but net. Fifty dollars later, the local print shop had copied, laminated and cut two sets of cards. (Clearly we have to work out production costs.) The game was a hit at our house. I was so proud of his creativity; it was a very different endeavor for him. He was so proud of himself that he got over the initial hurt when a certain cousin wasn’t all that impressed with his artistry. He was so proud, he asked me to write about it. March Madness began over cereal and milk and the Sports section, reading the disappointing news that our UCLA Bruins didn’t even make the competition. An hour ago, March Madness ended with us in pajamas, way past bedtime, rooting against all odds for Butler, a small Indiana school I had never heard of, to defeat mighty Duke. I had expected Duke to crush them. As you probably know (or maybe, I’m breaking the story for you? ), I was so wrong. Butler stayed with Duke point for point, never getting down more than 6, and usually staying within two. In the last two minutes of the game, they came back from a five point deficit, and were within one point. The game came down to the last 3.6 seconds. Down by 1 point, a Butler player named Gordon Hayward, snagged the rebound, hustled down court, lofted the ball from almost half-court and DAMN if the ball didn’t hit the backboard and the rim before bouncing out. Half an inch difference, he might have had a heroic, impossible, victory-clinching buzzer-beater shot, and the memory of a lifetime. Instead, at this very moment he is likely processing the would-have’s, the could-have’s, and maybe drying his eyes. The camera showed his parents earlier tonight, in the stands. Their son was at the free throw line, all eyes in the stadium, the country, on him. As he prepared to shoot, his mother and father appeared tense, looking down, like they were awaiting a verdict, or a grim diagnosis. I wonder if anyone else noticed that moment, before cutting back to the game, but I felt it along with them. I have a confession. I feel like that sometimes watching Little League. My child steps up to the plate and it’s all I can do to remember to breathe. We’re not supposed to cheer (at least not while they’re waiting for a pitch), so there’s no outlet for all that energy that’s coursing through my body saying, please please please: be happy. I’m not the only one like this; I am surprised there aren’t more heart attacks in the bleachers. The kids seem to handle the pressure okay. There are sometimes tears, but mostly not. There is disappointment, to be sure. I’ve watched Aaron walk back to the dugout after striking out, head lowered, only to see him a few minutes later chatting with his buddy on the bench, chewing huge wads of bubble gum and laughing, reminding me to breathe again. And I’ve watched him whack one out to left field, past the third baseman, arriving safely at first base, permitting me to release the tension with a giant whoop and holler. It’s good stuff, these highs and lows, this tension and comic relief, this life. I hope Aaron knows I’m proud of him, strike outs or base hits; drawings or not. I hope Gordon Hayward knows I was rooting for him. I would have given a lot for that ball to have Gone Swish.